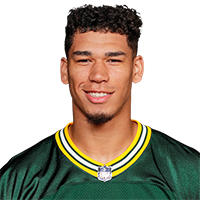 Lazard caught one pass for seven yards in one game with the Packers in 2018. Analysis: Lazard signed with Green Bay on Dec. 18 and saw his first NFL action during a Week 17 loss to the Lions, in which fellow wideouts Davante Adams and Equanimeous St. Brown did not suit up. The undrafted rookie made the most of his sole offensive snap, hauling in a seven-yard pass from backup quarterback DeShone Kizer in the fourth quarter. The 6-foot-4, 227-pound receiver will spend the offseason attempting to carve out a depth role. Lazard was signed by the Packers on Tuesday, Tom Pelissero of NFL.com reports. Analysis: Lazard was poached off the Jaguars' practice squad as the Packers bolster their depth at wide receiver with Randall Cobb still subject to the league's concussion protocol. Lazard went undrafted out of Iowa State in April despite a 6-foot-4, 227-pound frame, so he figures to be buried on the depth chart in Green Bay for the final two weeks of the regular season. There are no videos available for Allen Lazard. Click here to view all videos.